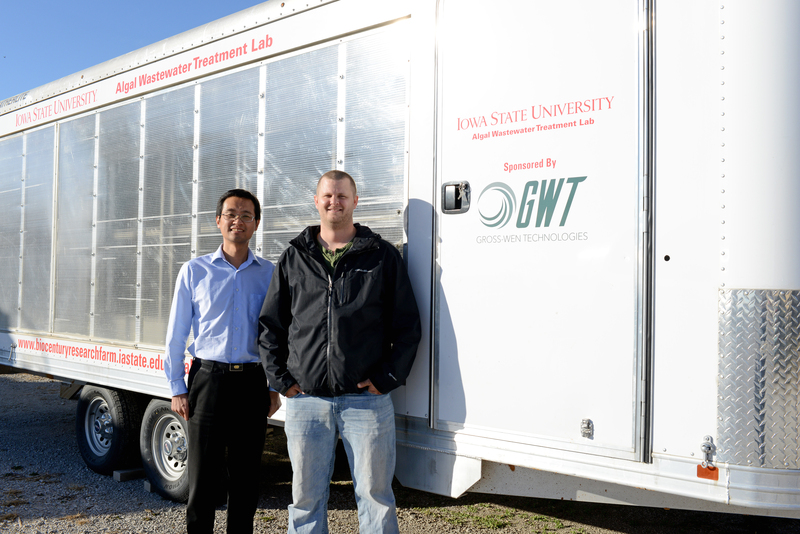 Dr. Zhiyou Wen and Dr. Martin Gross stand in front of their mobile Algal Wastewater Treatment Lab. AMES, Iowa – As Iowa State University researchers Dr. Martin Gross and Dr. Zhiyou Wen worked in their lab to develop an algal growth technology to create algal biomass, they never imagined that what they developed would also solve a problem much bigger and way beyond the original scope of their initial project. Their work led to the development of a technology that addresses the critical, global water quality issue of excessive nutrient pollution. This pollution creates the dead zones – hypoxic areas in the world’s largest bodies of water – that deplete the oxygen level needed to sustain marine life. Human-induced factors, such as agricultural runoff, fossil fuel consumption, and ineffective wastewater treatment are the largest contributors to the hypoxic conditions. New, more stringent governmental mandates are requiring wastewater treatment facilities to meet new nitrogen and phosphorus discharge limits. In 2013, Gross-Wen Technologies (GWT) was founded in an effort to commercialize the algal technology developed by Gross and Wen. The technology, called the Revolving Algal Biofilm Treatment System (RAB), utilizes a rotating biofilm that allows simple and low cost algal harvesting. What Gross and Wen soon discovered was the RAB system actually removed nitrogen, phosphorus and other pollutants 10 times faster than conventional algal wastewater treatment systems. According to Gross, the reduction of nitrogen and phosphorus entering our natural water bodies is vital in addressing dead zones such as the one found in the Gulf of Mexico. “Right now, municipalities are removing these pollutants from wastewater, but not as effectively and sustainably as our system,” Gross said. Gross states that the vertical orientation of the RAB system allows the system to take up 10 times less land area in comparison to raceway ponds, which have been the most popular algal water treatment system. In addition to clean water, GWT has derived additional side-benefits to their innovative, eco-friendly technology. GWT became part of the first ISU StartUp Factory cohort through their connection with the Ag Startup Engine, a new accelerator program for agricultural startups at Iowa State. The ISU StartUp Factory is led by managing director Bill Adamowski and housed at the Iowa State University Research Park. Entrepreneurs within the intensive 52-week program receive formal training, resources, and access to a network of business mentors, advisors, counselors, and investors. Dr. Gross and Dr. Wen examining samples in the lab. ISU StartUp Factory introduced Gross to his angel investor, Dave Furbush, founder and vice president of Midwest Project Partners, Inc., an Aureon Company. Furbush serves on the ISU StartUp Factory teaching team and came to know GWT through his affiliation with the program. According to Furbush, the attraction of partnering with GWT was immediate. In a recent press release, the ISU StartUp Factory announced GWT secured $225,000 in strategic angel investment financing from Furbush. The additional capital will provide GWT the interim funding they need to expand their business and increase their operational capacity prior to generating revenue from their products and services. Furbush is also a firm believer in the value of giving to get back, echoing the lessons taught during the ISU StartUp Factory’s “Sales Boot Camp” session within the Customer Discovery phase of the program. The boot camp is a two-day introduction into David Sandler’s sales techniques, designed to help the startups gain a better understanding of potential customer’s needs. Gross said the investment capital will go a long way in helping GWT expand their business and increase their operational capacity. For example, $40,000 of the investment money along with $40,000 cost-sharing funds from Iowa State’s Center for Industrial Research and Service(CIRAS) will be used towards an $80,000 project to evaluate GWT’s technology in order to receive DNR regulatory approval. The project requires data to come from communities of differing sizes. For the smaller municipalities that use lagoon treatment, GWT will take their pilot-scale mobile RAB treatment system to Dallas Center for a year-long pilot run. GWT also plans to build a new reactor in the BioCentury Research Farm to perform a pilot run treating approximately 1,000 gallons per day of City of Ames wastewater. GWT has already piloted their technology at an industry location in Fort Dodge, and their process is being used through a joint project with Iowa State and the Metropolitan Water Reclamation District of Greater Chicago at the rate of 6,000 gallons per day. Drs. Gross and Wen were joined by Dr. Darren Jarboe, VP of Business Development in 2014. With the recent funding, the company plans to more than double their workforce by adding research technicians, administrative staff and interns. And as Furbush sees it, the RAB system is a game-changer for global water quality issues and, a bonus for Iowa’s economic development. “It’s really fantastic that all this started here in Iowa,” he said.